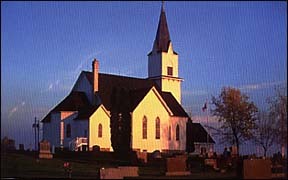 Nordland Lutheran Church, rural Hawick, is one of 24 Lutheran churches in Minnesota featured in a year 2000 calendar, created by photographer Doug Ohman and Lutheran Social Service (LSS) of Minnesota. All of the profits from the sale of the calendar will be used to help people affected by the difficult agricultural economy in rural Minnesota. Nordland Lutheran Church was chosen from the estimated 1,200 churches from across Minnesota, based upon its historical and architectural significance. Every month the calendar features two churches with a brief description of the location and history of each church. "To me the church really speaks to a lot of people," Ohman said. He has researched all of his photographed churches and has discovered a wealth of information about church history, including who built these churches, why settlers who attended them migrated to certain parts of the state, and why there are differing architectures. Ohman said that his overall mission is to preserve a special place for these churches in history. "If there is one building in a rural community that speaks to people, it's the church. A farmhouse speaks to a family or two, but the church speaks to the whole community," Ohman added. In order to learn about a church with no written history, Ohman either speaks with clergy members or with neighbors of the building. Ohman explains, "I knock on a farm home near the church. When they realize I'm not trying to sell them anything, they usually invite me in for a cup of coffee. They share stories about their family's relationship to the church or what has happened to the building over the years. I end up leaving their house learning about so much more than the church--their views on the farm crisis, politics, and the youth of today." During days off from his normal job as operations manager at Knott's Camp Snoopy in the Mall of America, Ohman pursues his avocation, photographer and historian of churches across Minnesota. Ohman has traveled 20,000 miles across the back roads of Minnesota to take photographs of more than 1,000 churches. With the help of his family, Ohman has been able to travel the state to preserve an important part of history while creating the largest collection of church photography in the state. "The calendar is an original historical collection of Lutheran church photography and history, with all of its proceeds going back to the communities from which these photographs originated, explained Bill Fredell, director of communications at LSS. "We hope to raise a significant amount of funding to help as many people and families as possible." The calendars can be ordered through the youth at Nordland Lutheran Church, or by contacting LSS at 1-800-987-0034 or at www.lssmn.org.